Kids love Frozen! And, it’s a fun way to keep your young distracted learners motivated during your math lessons. ‘Check out these FREE counting Frozen worksheets from Fun Learning Ideas! Make introducing math easy and fun with do-a-dot pages, playdough work, tracing, and more! Your young kids will love counting after these activities! 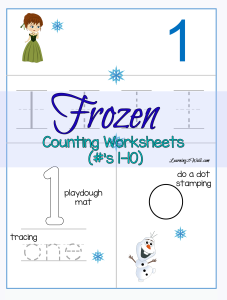 Grab the Frozen Counting Worksheets here!